Nitrogen is essential to marine life and cycles throughout the ocean in a delicately balanced system. Living organisms—especially marine plants called phytoplankton—require nitrogen in processes such as photosynthesis. In turn, phytoplankton growth takes up carbon dioxide from the atmosphere and helps regulate global climate. The nitrogen cycle is a critical part of the earth’s balance. According to new research by Thomas Weber, an assistant professor of Earth and environmental sciences at the University of Rochester, small microenvironments in the deep ocean may hold key clues to the global cycling of nitrogen in seawater. In a paper published in Nature Geoscience, Weber and his co-author Daniele Bianchi, an assistant professor of atmospheric and oceanic sciences at UCLA, show that small microbes that remove nitrogen from the water exist in these microenvironments and are more widespread than previously thought. Using this data, they developed a computer model that changes the way we think about the marine nitrogen cycle. Most marine organisms “breathe,” or respire, using oxygen. 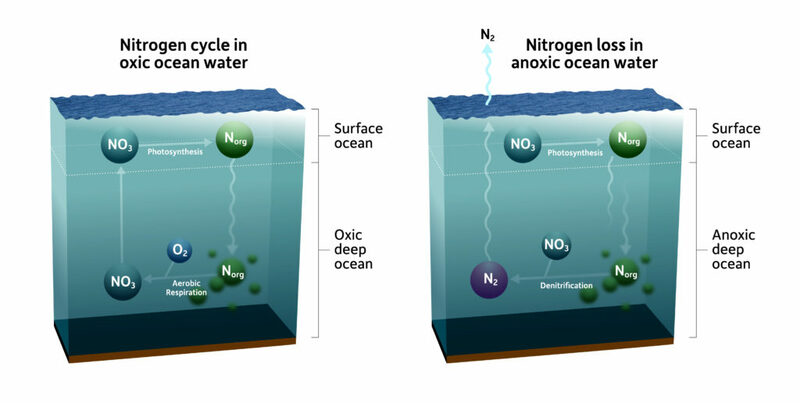 When oxygen is not present in seawater, microbes instead respire using other compounds like nitrate, a form of nitrogen. “This has the net effect of removing the nitrogen from the ocean,” Weber says. Weber and Bianchi have developed a computer model that takes into account new genetic data gathered from ocean microbes. The data indicates that anaerobic microbes exist not only in areas of unoxygenated water, but somehow thrive in areas of the ocean where there is oxygen. 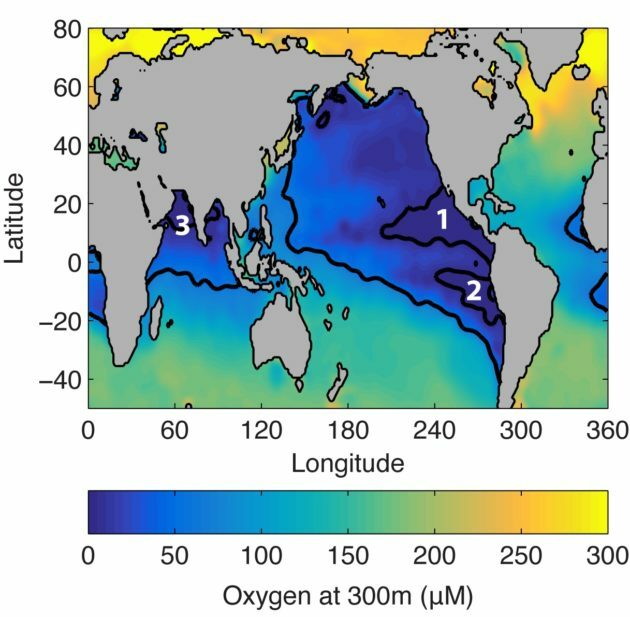 Nitrogen, therefore, may be lost across much of the ocean, not just in areas where oxygen is scarce. “One of the biggest revolutions in oceanography in recent years has been the genomic revolution,” Weber says. “Oceanographers have been able to measure all of the genes present in seawater.” One of their discoveries was that the genes allowing anaerobic respiration are not just found in the three regions; the genes have been found much more widespread throughout the ocean. How then, do these anaerobic organisms survive in areas where oxygen is present? Weber and Bianchi found that small “microenvironments” depleted of oxygen exist all over the deep ocean in organic-rich “marine snow”—particles of organic matter, such as dead plankton cells and zooplankton feces, stuck together. Microbes gain energy by eating the organic matter and using oxygen to respire. If the respiration is intense enough inside the particles, all the oxygen can run out and the microbes will switch to respire using compounds besides oxygen. 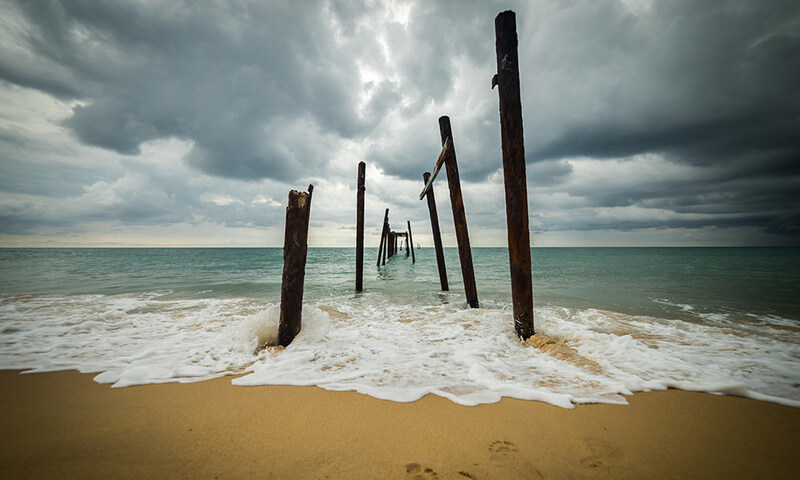 Global warming causes ocean temperatures to rise, resulting in an increased loss of oxygen, which can then affect the nitrogen budget across the globe. When humans perturb one part of the system, it can have unexpected effects. But computer models can help better predict these consequences.